The Airbus A380 has two full-length decks of 49.9 metres (164 ft), though the upper deck has a slightly reduced usable length of 44.93 metres (147.4 ft) due to the curvature of the front fuselage and the front staircase. The width of the main deck and upper deck measures 6.50 metres (21.3 ft) and 5.80 metres (19.0 ft) respectively. Passenger capacity varies with the seat configuration chosen by the operating airline. While the A380-800 is certified for up to 868 passengers in a one-class configuration (538 on the main deck and 330 on the upper), Airbus references a "comfortable three-class" 544-passenger configuration in their marketing material. However only Air France has come close to that number in a three-class configuration, with 538 seats (9 First, 80 Business and 449 Economy). Of the planes currently in service, the passenger capacity ranges from 379 (4-class layout in Singapore Airlines) to 615 passengers (2-class layout in Emirates). From late 2015, Emirates started operating planes seating 615 passengers in two classes for the Copenhagen route, the most ever seen, replacing the smaller Boeing 777. In all, 15 aircraft will use this configuration. Airbus offers 11-abreast seats for delivery in 2017. Some airlines have speculated configuring the planes for higher seat numbers, including a one-class layout seating 840 people. Pitch/Bed Length/Width – – – 31"/–/17.5" 80"/80"/29.5" 73"/73"/20" – – 9 "First Apartment"
with private bathroom and bedroom. ^ "A380-800 / Cabin layout & comfort". Airbus. 7 August 2015. Archived from the original on 6 July 2011. ^ Mutzabaugh, Ben (16 April 2015). "Emirates Pushes A380 Seating Capacity Past 600". USA Today. Retrieved 31 May 2016. ^ "Emirates Seat Maps Airbus A380-800 (388) Two Class". SeatGuru. Retrieved 24 July 2018. ^ Hitching, Chris (12 November 2015). "Cattle Class Just Got Bigger: Emirates Unveils New Airbus A380 with a Record 615 Seats After Ripping Out First Class to Pack in More Passengers". The Daily Mail. London. ^ "Emirates Launches Daily A380 Service to Copenhagen". Emirates Denmark. Retrieved 10 April 2015. ^ "Emirates to Deploy the World's Biggest Aircraft on Its Copenhagen Service". CPH press. 9 April 2015. ^ "CPH: A380 er en milepæl for os". Check-in.dk. 10 April 2015. Archived from the original on 17 October 2015. ^ "Verdenspremiere i CPH på 615-sæders fly". Check-in.dk. 10 April 2015. ^ Flottau, Jens (14 April 2015). "Airbus Offering 11-Abreast A380 Seating From 2017". Aviation Week & Space Technology. Retrieved 15 April 2015. ^ a b "Emirates A380s to Establish New Airliner Seat Record". Aviation. 8 June 2008. ^ "Airline to Turn A380 Superjumbo into Sardine Can". Sydney Morning Herald. 2009. ^ "Plan for 840 Seat All Economy A380 Ditched by Air Austral". Crikey. ^ "Air Austral to Launch Ewa Air on October 29 as A380 Talks Drag On". CH Aviation. ^ "Flight Check: Singapore Airlines A380". Business Traveller. Retrieved 11 July 2008. ^ "Air France Seat Maps Airbus A380-800 (380)". SeatGuru. ^ "ANA Unveils the Features of Airbus A380". All Nippon Airways. ^ "Asiana Airlines Aircraft Information - A380-800". Asiana. ^ "Asiana Seat Maps Airbus A380-800 (380)". SeatGuru. ^ "Airbus A380-800". British Airways. ^ "British Airways Seat Maps Airbus A380-800 (380)". SeatGuru. ^ "First A380 for China Southern Airlines Takes Off for Final Round of tests". China Southern Airlines. ^ "Emirates Unveils A380 Seat Plan". Gulfnews. Archived from the original on 19 June 2008. ^ "Emirates Publishes Timings and Seat Plans for A380 Flights to Oz/NZ". Business Traveller. 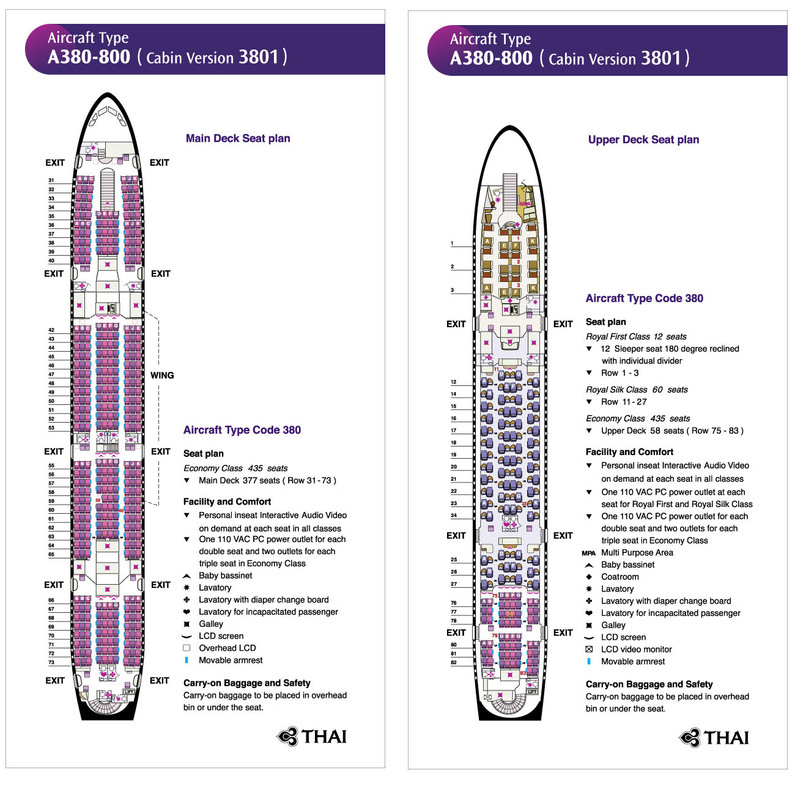 ^ "A380 Seat Map". Etihad. ^ "Airbus 380-800". Korean Air. ^ "New Cabin Design: The Customer's Opinion Counts". Lufthansa. Archived from the original on 28 October 2008. ^ "Malaysia Airlines Unveils A380 Configuration". FlightGlobal. 8 March 2012. ^ "MAS Reveals A380 details". Asian Aviation. 8 March 2012. ^ Stanley, Bruce (25 July 2007). "Qantas Flaunts Super-Jumbo Perks". The Wall Street Journal. Retrieved 19 June 2008. ^ "Photos Qatar Airways A380 Makes Doha Debut". Doha News. 20 September 2014. Retrieved 20 September 2014. ^ Painter-Bosworth, Nicholas (7 April 2015). "Middle Eastern Carriers Show Their Gulf in Class". Flightglobal. Retrieved 8 April 2015. ^ "Singapore Airlines A380-800 (Suites and Business Upper Deck)" (PDF). Singapore Airlines. Retrieved 24 July 2018. ^ Bright, Craig (2 November 2017). "Singapore Airlines unveils new A380 seats". businesstraveller.com. Business Traveller. Retrieved 24 July 2018. ^ "Thai Airbus A380". Thai Airways International. Archived from the original on 3 January 2014. This page was last edited on 22 March 2019, at 22:54 (UTC).